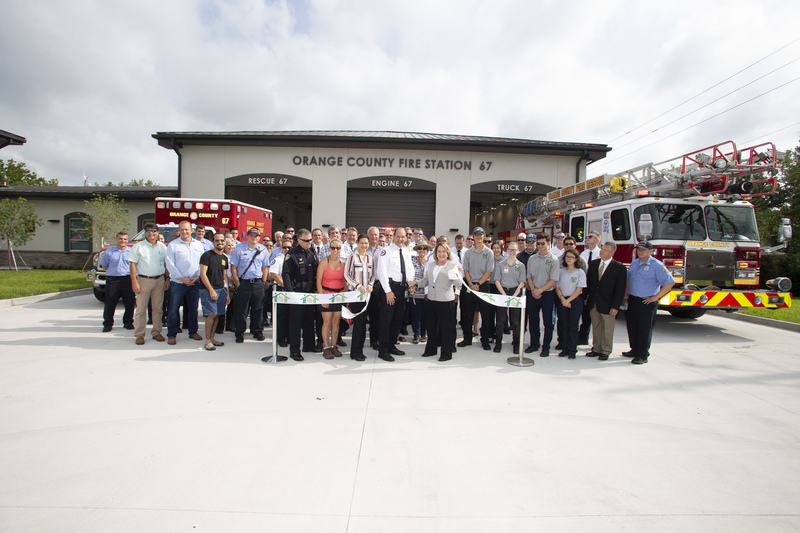 Orange County Government celebrated the opening of Fire Rescue Station 67 on June 4, 2018. Mayor Teresa Jacobs was joined by District 3 Commissioner Pete Clarke, District 5 Commissioner Emily Bonilla, Orange County Fire Rescue (OCFRD) and Chief Otto Drozd III for a ceremonial ribbon cutting at the new station in east Orange County, in close proximity to the University of Central Florida. The need for a new fire station at its location was based on a comprehensive station location study that identified trends in the area reflecting the current and projected demand on OCFRD services. The study focused on new home construction, emergency call volume and medical transports and forecasted population growth. The project was presented to the Orange County Board of County Commissioners in 2015 to reduce response times in the area. A budget of $6.4 million was allocated to the project including the purchase of land, construction costs, emergency vehicles and equipment. Mayor Jacobs’ $300 million INVEST in Our Home for Life initiative, was announced in 2015 to fund a series of projects that will provide long-term benefits to Orange County residents. Orange County Fire Rescue will receive $30 million over the next five years to fund three new fire stations, new fire apparatus and equipment and partial funding for a regional fire training facility. The funding will ensure that OCFR has the ability to continue its industry-leading performance and deliver exceptional levels of service to the resident and guests of Orange County. For more information about INVEST in Our Home for Life initiative, visit www.ocfl.net/invest. Photo Caption: Orange County celebrates the opening of Orange County Fire Station 67 in east Orange County near UCF at ribbon-cutting ceremony on June 4, 2018.